Always take dobes to the same potty spot. Dobermans are one of the easiest breeds to train due to their high intelligence level and eagerness to please their masters. Positive reinforcement and consistency are the main steps to housebreak a dobie. Most dobes are accident-free within a couple weeks. Choose a command to give your dobie before taking him outside. The “Outside!” command should be given enthusiastically in a high-pitched voice. With your dobe on a leash, take him to the designated potty area. Teach the “Go potty” command. Wait until your dog begins relieving himself and say “Go potty” in a calm and confident voice. Once your dobie has finished eliminating, say “Good potty!” in an excited and high-pitched voice while giving him treats. The treats must be given as your dog is still outside. If you give the treat inside, your dobe has likely forgotten what the treat is for. Confine your dobe when he's unsupervised. Your dobe instinctively doesn't want to potty inside his den-like crate. To crate train your dobie, say “Crate time!” and place him in the crate with treats. Keep him inside the crate for five minutes while you're in the same room. Release your dobe and praise him verbally and with treats. Gradually continue to add five-minute increments until pup stays in the crate 30 minutes. Repeat the steps starting back at five minutes, but with you not in the room. Work day-by-day increasing five-minute increments until you reach 30 minutes. Correct your dobie with positive reinforcement. A puppy will have an accident in your home. If you catch him in the act, say “No!” and quickly follow with an enthusiastic “Outside!” command. Take your dobie to the desired location and allow him to finish. Once he potties in his approved spot, praise him with “Good potty!” and give him a treat. Schedule times to eat, play and potty. A dobe puppy needs to relieve himself several times per day and immediately after waking up, after playing or after eating or drinking. The minimum potty times for a dobie puppy differ by age, so dobes up to 14 weeks old need a minimum of 10 potty breaks; 14 to 22 weeks old need a minimum of eight potty breaks; 22 to 32 weeks old need six potty breaks, and adults need a minimum of four breaks, according to Kennel Club author Lou-Ann Cloidt. Clean messes with an enzymatic cleaner while your dobe is in his crate. When choosing a crate size, be sure your dobe can lie down, stretch and stand without his head rubbing the top of the crate. Only remain in the designated potty spot for five minutes before returning inside. Your dobie needs to learn to do his business quickly so he doesn't use potty time as play time. Never punish a dobie for having an accident. Accidents are your fault for not staying consistent with training and failing to notice signs, such as circling and sniffing. 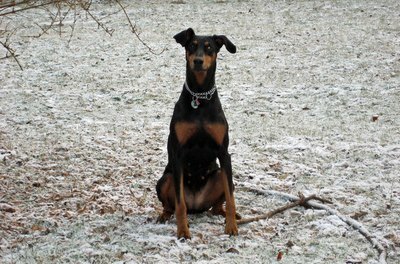 A physically punished dobe can develop an aggressive temperament. Never line crates with newspapers since a puppy may associate voiding with newspaper. 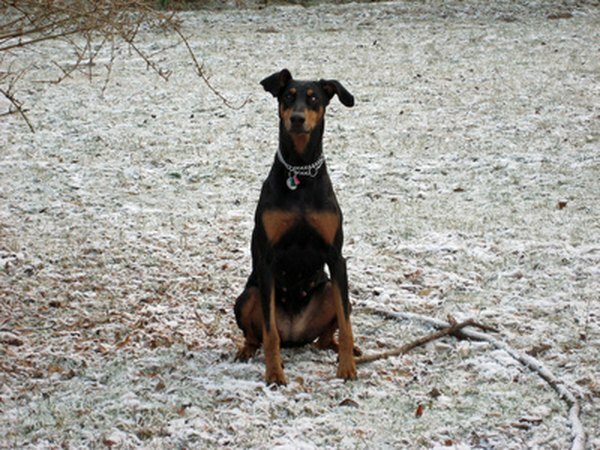 Avoid conflict in front of your dobie since they are sensitive to their surroundings and often have accidents if overly stressed, even after being housebroken. Gentle Doberman: What Does the Puppy Recognize as His Den? What Is the Easiest Dog to Housebreak?